About "Solving absolute value inequalities"
"Solving absolute value inequalities" is the stuff which is being studied by the students who study high school math. 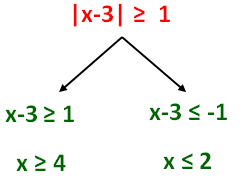 Here we are going to see, "How to solve an absolute value inequality"
We can completely understand "Solving absolute value inequality" by going through the two methods which are explained below. 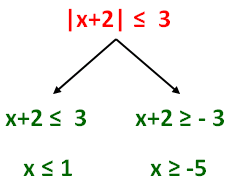 Let us see how the above mentioned absolute value inequality can be solved. The picture given below clearly explains you "How the above inequality can be solved"
If we combine the above two graphs, we will get a graph as given below. Let us look at some practice problems on "Solving absolute value inequalities"
In this problem, we have "less than or equal to " symbol. So, we have to apply "Method 1"
Let us look at the next problem on "Solving absolute value inequalities"
In this problem, we have "greater than or equal to " symbol. So, we have to apply "Method 2"
First Let us write the given absolute value inequality in standard form. In this problem, we have "less than or equal to" symbol. Apart from the stuff and problems on "Solving absolute value inequalities, You can also visit the following pages. If you want to know more about "Solving absolute inequalities", please click here.